Oyu Tolgoi Copper and Gold Mine - Scott Springfield Mfg. 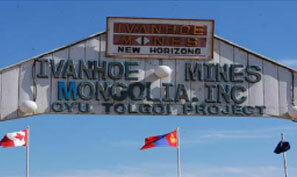 Oyu Tolgoi is located in the South Gobi desert of Mongolia, 80km north of China. Soon to account for 3% of the world’s supply of copper and gold, the 6.5 billion dollar project will produce an expected 450,000 tonnes of copper and 330,000 tonnes of gold annually. Employing just fewer than 10,000 employees during the development phase and just over 3,000 during production phase, the Oyu Tolgoi mine is the biggest foreign-investment project ever in Mongolian history. The location of the mine was SSM’s biggest design hurdle. The air handling units had to be specially designed to withstand Mongolia’s harsh desert climate including sandstorms, below freezing temperatures, and blistering heat. Temperatures at the Oyu Tolgoi mine range from -40°C to +50°C and can fluctuate up to 35°C in one day. The design team at Scott Springfield were required to not only design systems that could withstand Mongolia’s weather conditions but also to design systems with an electrical rating foreign to our own. In Canada, typical electrical requirements are rated at 600V/3ph/60Hz whereas in Mongolia, the electrical requirements are 690V/3ph/50Hz. Custom transformers and custom breaker panels were designed to meet the requirements while wiring and other electrical components were sourced to give the customer the complete Scott Springfield custom package in an electrically compatible format. The air handling units were designed for these ratings without sacrificing Scott Springfield’s reputation for high quality custom air handling design and build. Inertia filters were engineered to block and prevent infiltration of sand into the air handling units during a sandstorm. The filters were used in conjunction with bleed fans to eject the sand before it entered the electronic filters. The electronic filters were installed to ensure that the highest air quality was provided in even the harshest conditions. Scott Springfield’s standard low temperature outdoor air hood with a hinged bird screen was used on the Oyu Tolgoi project. These outdoor air hoods are used to assist in the removal of hoar frost build up on the bird screen. When the bird screen starts to build up, it increases the pressure drop across the screen thus increasing the suction on the fan. The screen starts to tilt to allow proper airflow. At a certain point, the spring loaded screen is forced back to its standard closed position while the screen taps the housing of the hood, clearing the hoar frost. This system has been the best solution to prevent the buildup of hoar frost on the bird screen while also maintaining proper unit operation. Due to the physical size of the AHUs, they were required to be split and shipped in multiple sections. Each section was wrapped in polyfilm then wood crated while meeting the required international shipping standards. The large amount of spare parts ordered were packaged and shipped in export containers purchased by the client. The containers were required to ease the handling of spare parts as well as to act as storage once they arrived on site. Scott Springfield Mfg. Inc. has an outstanding reputation in the industrial market. Air handlers are regularly engineered to withstand extreme cold, heat, and other environmental factors. The Scott Springfield solution is the right choice for all industrial applications that require custom or standard features. A Scott Springfield air handler will keep your process running while providing fresh clean air to all areas that it serves.